A Hero can do anything, and well. He is not afraid, he is strong and brave. He has great ambition. He has a weapon on his belt if a fight is necessary. 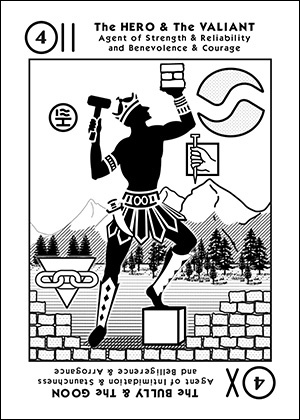 But the hammer and bricks that he holds tells us he is about building. His foot rests upon the cornerstone of his latest productive effort. It will be a stable construction, with sturdy, solid walls. He will provide and lead. A Valiant with nail in hand does what he can to help. His courageous effort will be rewarded. Working diligently, he promotes industry. He is noble. He just wants to help others where he can. He is empowered by the leadership that supports him. This is a card for people who get stuff done. This is a card for people who fight battles for us.